← Are You Letting Your Luxuries Become Needs? As European capitals go – Stockholm has a reputation for being sleek, stylish and above all – pricey. While many budget travelers may forgo this gorgeous city for less expensive locales, a weekend in Stockholm doesn’t have to break the bank. With a few helpful tips, navigating this Scandinavian marvel can be fun, fascinating and relatively inexpensive…relatively. 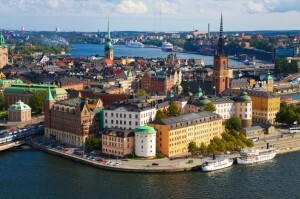 One of the best ways to save money is to purchase a Stockholm Card, even if you’re just staying in Sweden for a few days or taking a quick weekend in Stockholm. This is a sightseeing card that allows visitors free admission to museums, historical sites, other attractions and free travel on the bus and subway systems. Visitors can purchase a Stockholm Card at any number of hotels with 1-2-3 or 5 day options depending on the length of stay in the city. The card is a fantastic way to see the city and it pays for itself quite quickly. From the Stockholm City Hall (home of the annual Nobel banquet) to royal residences like Drottningholm Palace, the Stockholm card is easily the best ticket in town. Food and drink in Stockholm is expensive, this is an unfortunate and undeniable truth. That said – there are ways to sample authentic (and delicious) fare without going home broke. One of the best ways to save is to take advantage of daily specials at restaurants as well as buffets. Whether it’s a hotel breakfast buffet or a slightly swankier locale; pack your plate and head back for seconds so you can limit meals and avoid going hungry. For an authentic culinary experience that offers both ambiance and sustenance head to market halls for fresh foods. Östermalms Saluhall is one such destination offering sausages, cheese and fish in a charming 19th century setting and even boasts a few restaurants and takeaway stands inside. The great thing about Stockholm is that it’s also the perfect place to browse the shop windows. With its international reputation as being one of the most stylish and design-minded cultures in the world, Stockholm window shopping is almost as good as the real thing. There are plenty of hostel options in Stockholm which are relatively inexpensive and can come in some rather unique forms, such as former prisons or ships in the middle of the city! While they’re not the cheapest dorm rooms you’ll ever pay for, there are some great spots that are full of character and friendly faces. Alternatively, try inexpensive hotel chains like the Welcome Hotel, as these are often located in key areas throughout the city. A visit to Stockholm can be beautiful, stylish, fascinating and comfortable without draining your savings. Knowing where to go, how to get around and what pricey pitfalls to avoid can ensure a fabulous Scandinavian holiday that you’ll remember forever.